Cape Town - Springbok captain Eben Etzebeth said his team is looking forward to test themselves against a very good Irish team on Saturday at the Aviva Stadium in Dublin. "We know it's going to be a real tough Test but we are looking forward to resume our battle against the Irish. We had an unbelievable series last year in South Africa, but this time they are playing at home and with the advantage of a home crowd," explains Etzebeth. "They have some world class players in their team and they are very good at set-pieces and keeping possession. We know we will have to work extremely hard against a quality Irish side. "As coach Allister (Coetzee) has said earlier in the week, we don't see this as an end of the year tour. 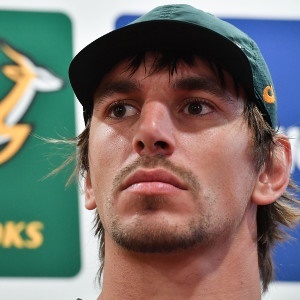 "This is the Outgoing Tour, it consists of four matches and we will take it game by game, starting tomorrow evening in Dublin," said Etzebeth, who will play in his 64th Springbok Test on Saturday. Meanwhile, the Springboks wrapped up their match preparations on Friday afternoon with a captain's walk-through at the Aviva Stadium, the venue for Saturday's Test. The game starts at 19h30 SA time and will be televised live on SuperSport. South Africa will also play against France, Italy and Wales on their month-long tour of Europe.